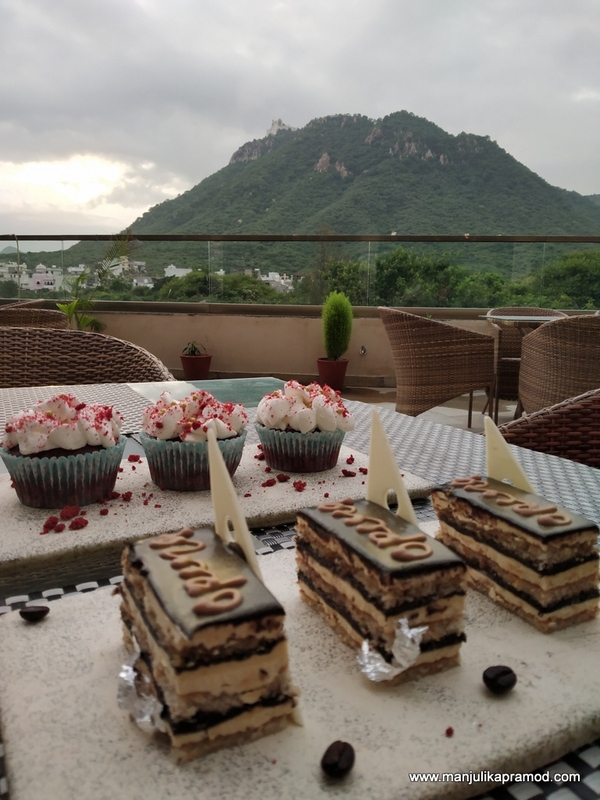 A perfect weekend trip to Udaipur! 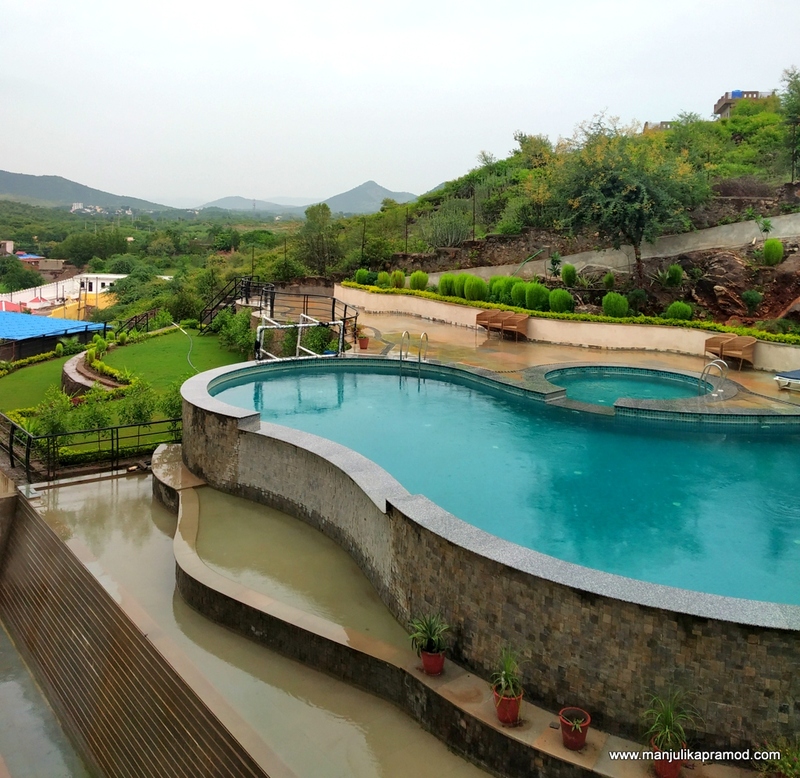 My weekend trip to Udaipur turned into a delightful sojourn by the monsoon showers welcoming us, the overcast skies lending a cool ambiance and the state-of-the-art suite in JUSTA Sajjangarh pampering us like royals. 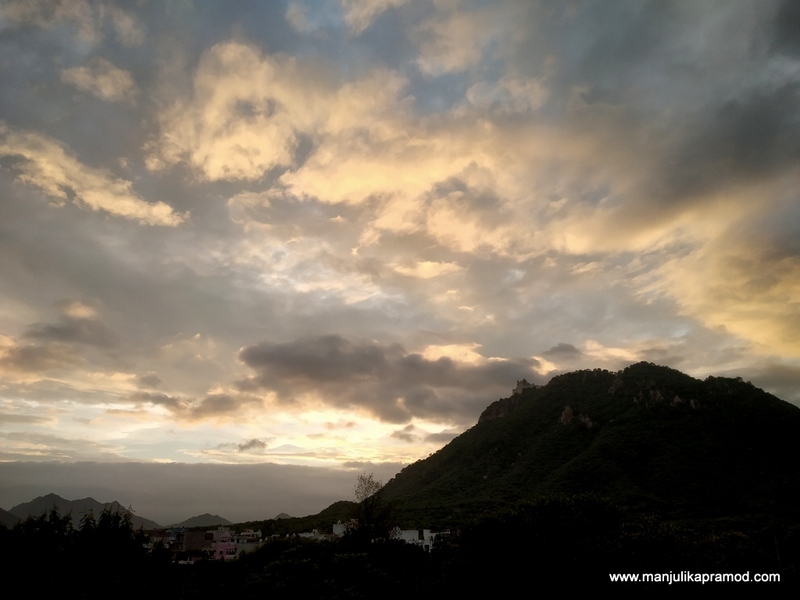 We literally indulged in one of the loveliest views of the Monsoon Palace or Sajjangarh fort. A miniature version peeped in our room day and night and we couldn’t get enough of it. Many a times, we were transfixed, gazing at the rolling hills and the fort while enjoying the solitude. With the clouds floating by the day and lights taking over it in the night, personally it left us mesmerized with its many views. The ‘us’ in the above lines implies hubby and I. Another high of the trip was that I was joined by my husband who managed to take a break from his ‘living out of a suitcase’ kind of life. If you know a consultant around you, I am sure I do not need to get into the details. I have lived in rooms with views of a beach, the alps, flowing river, Himalayan ranges, infinity pool but never a fort. This was different for sure. The fort and the valley view from our suite at Justa Sajjangarh was one of the best views that I have experienced. 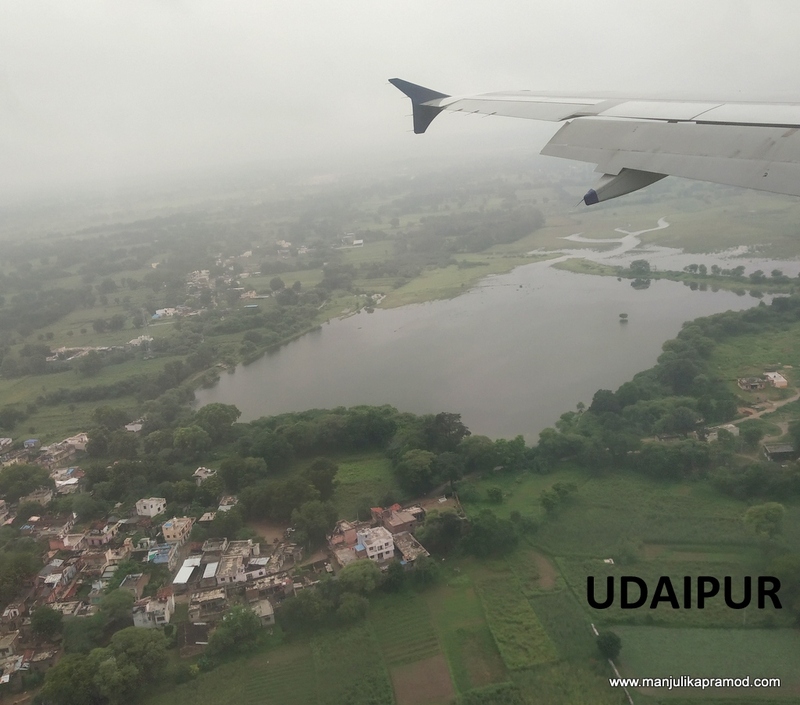 A one-hour flight mapped the distance between Delhi and Udaipur and we landed at Maharana Pratap Airport. The name of the airport was enough to take me back in history and ruffle the pages about the famous Mewar warrior. This was my first trip and I was excited to be in the “White city” or the “City of Lakes”. Our driver from the hotel was waiting to drive us to the neighborhood of Sajjangarh Biological Park where Justa had come up with their new property. While he drove, I observed the city silently. The next forty minutes were my first impression of Udaipur. 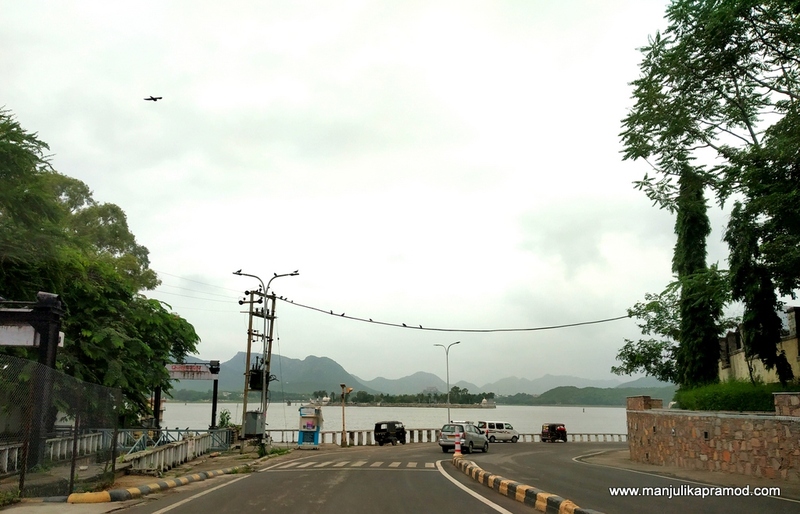 Fateh Sagar lake came on the way and grabbed our immediate attention. I couldn’t be without stopping by. 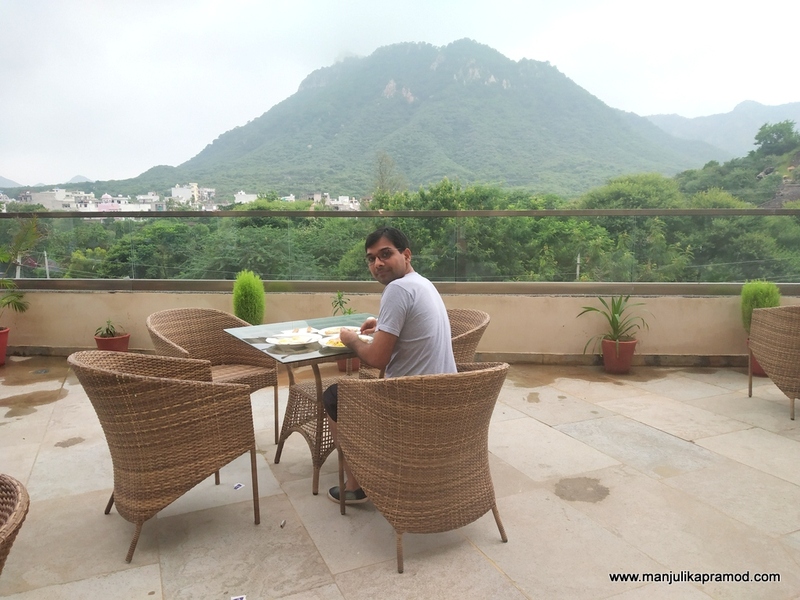 By the time we reached the Sajjangarh area, it was clear that we had steered clear off the crowds of the city and had landed at a spot which promised a relaxing and peaceful haven. In the month of September, the views around were pleasantly green and refreshing. For one moment, it did not seem like Rajasthan at all. 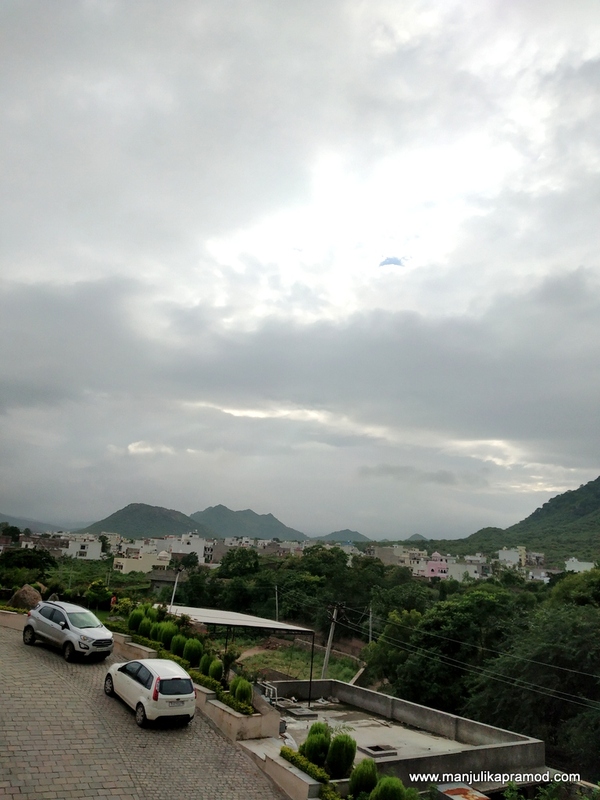 I had heard people quote “Udaipur is different” and now I knew why. A hassle-free check in and a refreshing welcome drink always cheers me up. It was a great start. 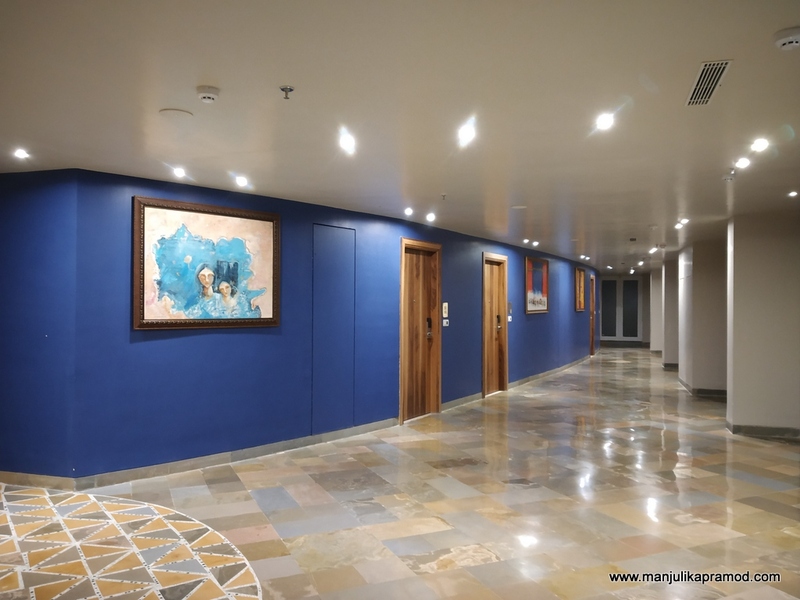 A short walk towards the room introduced us with the pleasing designs and soulfully decorated corridors of the hotel. There were paintings on both sides of the walls and each one called for time and appreciation. I assured myself that I would have enough time to come back and see them properly. For now, I was eager to check on the room. Despite having lived in hundreds of hotels, I am always excited like a kid to enter my room in every hotel. I kind of like those freshly done rooms which have an air of comfort. We opened the room and it made us say ‘Ooh la la’. I was taken over by the splendor of the room, the memories of which will remain for long. 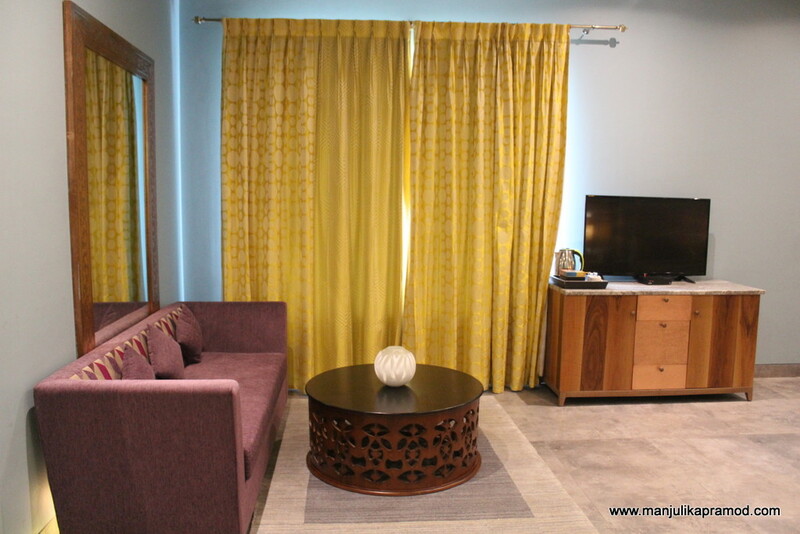 The suite was staggeringly spacious and lovingly furnished with quirky colors. The use of bright orange, yellow and blue seemed to be used on purpose to set you in a happy and cheerful mood right at the word go. As we made way to our suite, we were transported to the world of vibrant colors and art. The suite was staggeringly spacious. We loved it in the first look itself. It had a cute dining corner! How about a cozy section too? 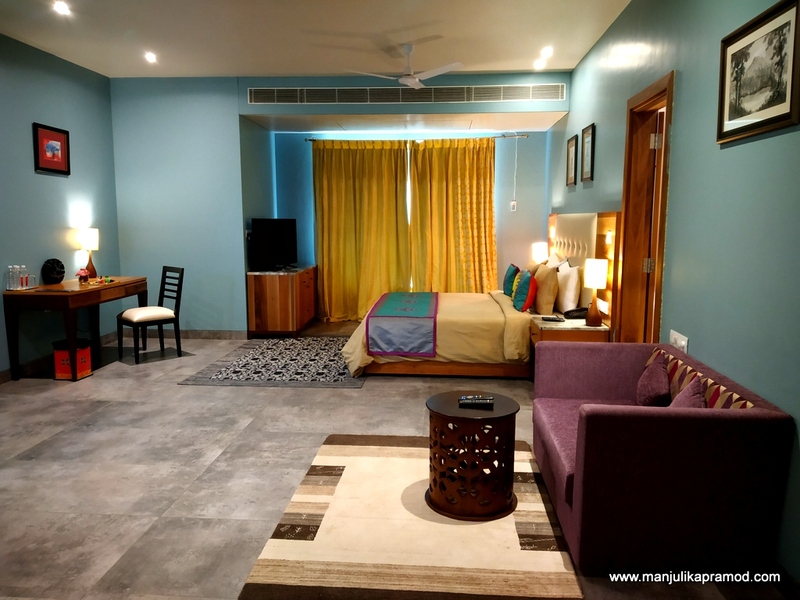 The crispness of the bed sheet, the many beautiful things in every corner, the two washrooms, a small dining area and a living area made it a complete house. This made for a perfect room for travelers with families. There were two televisions, one that faced the bed and other in front of the sofa in the section that qualified as a living room without a partition. The jacuzzi in the bigger bathroom was an added luxury. It also had a glass wall which promised you the views of the hills. However, the winner was the window view with a couch by its side. The views of the spread out valley, verdant hills, neighborhood and the Sajjanfort fort gave a sense of excitement as well as peace. One could lie down here and make their own conversations for hours. For those who like privacy and quiet-time, the room was far away from regular hotel bustle and promised complete silence. While I clicked some pictures, hubby was quick to declare, ‘I love the room’. Trust me, it doesn’t come in so easily. 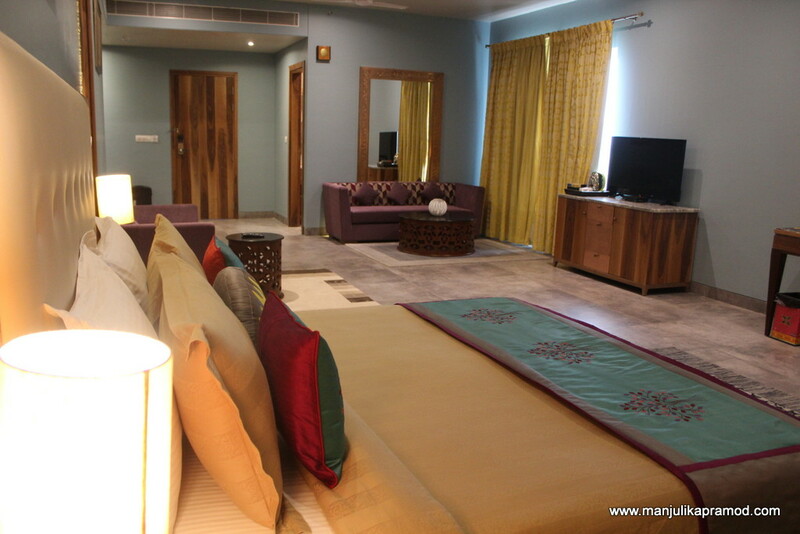 Udaipur is not a place where you would want to stay indoor but this room had everything to keep you in a holiday mood. 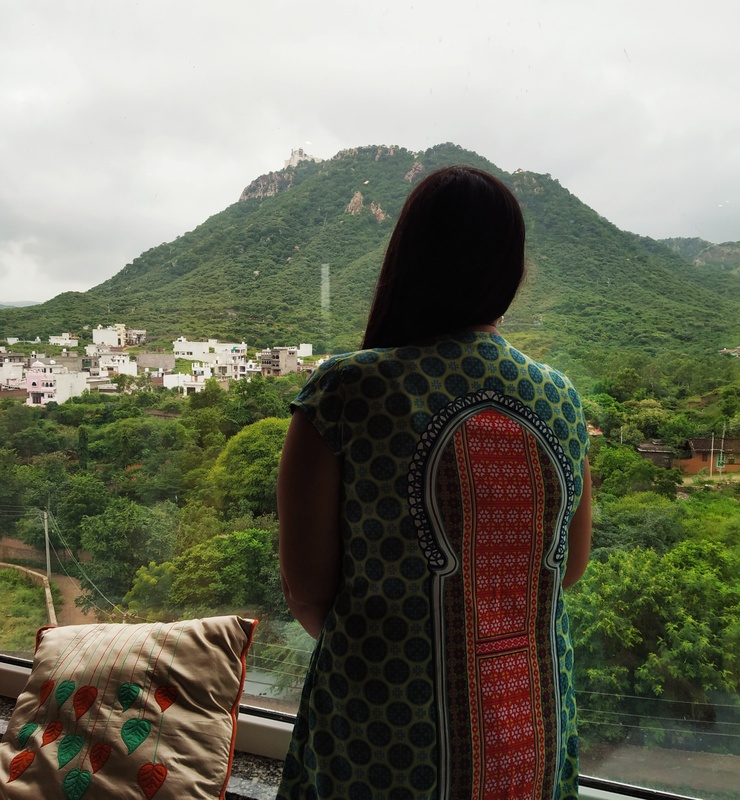 While I changed and rebooted myself, hubby figured out that there was an open sitting area right below our room and it offered better views of the fort. In next few minutes, we were already making our way to the in-house restaurant which extended to that open balcony. We ordered for our first snacks and evening tea under the sky. Thank God we did that because in the following two days, it either kept drizzling or raining and thus we had to keep indoors. This open area was one of our favorite places to spend our leisure time. The view of the famous Sajjanfort was best enjoyed from here. One the first day we were pampered by the vagaries of mountain nature. Can you spot the fort at the top? 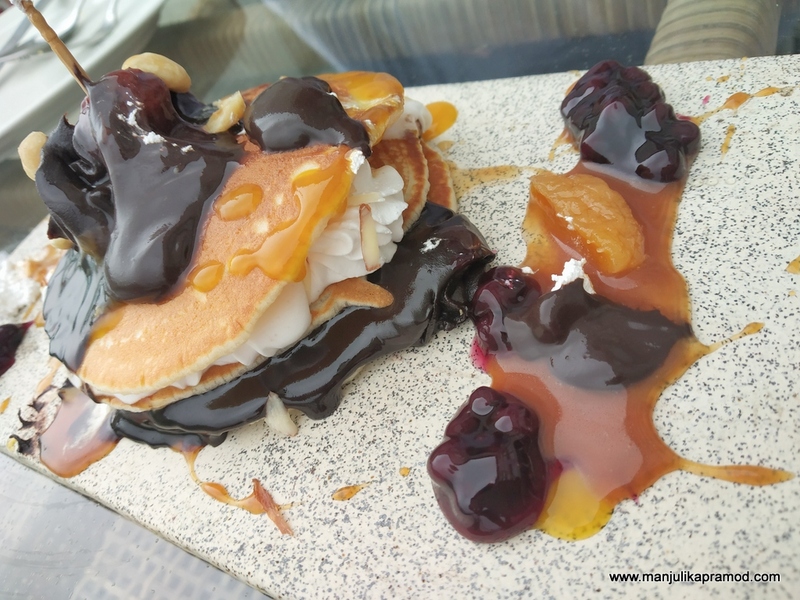 When we landed at the restaurant for the first time, we did not know that we would be spending most of our time here if not sleeping or exploring Udaipur. 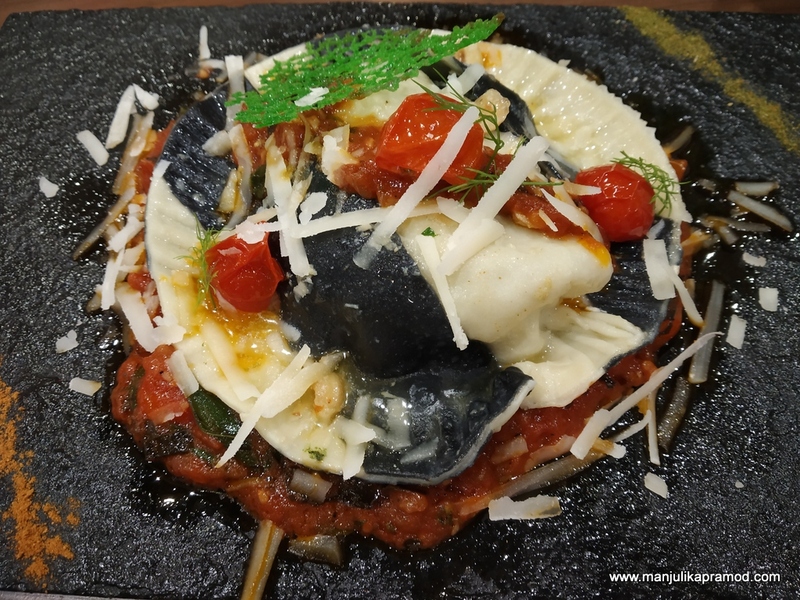 It was spacious, brightly lit and offered lots of good things to eat. Most of our conversations with the Chef and even with each other happened here. We would either sit down to admire the fort, make our day itineraries or talk about food. 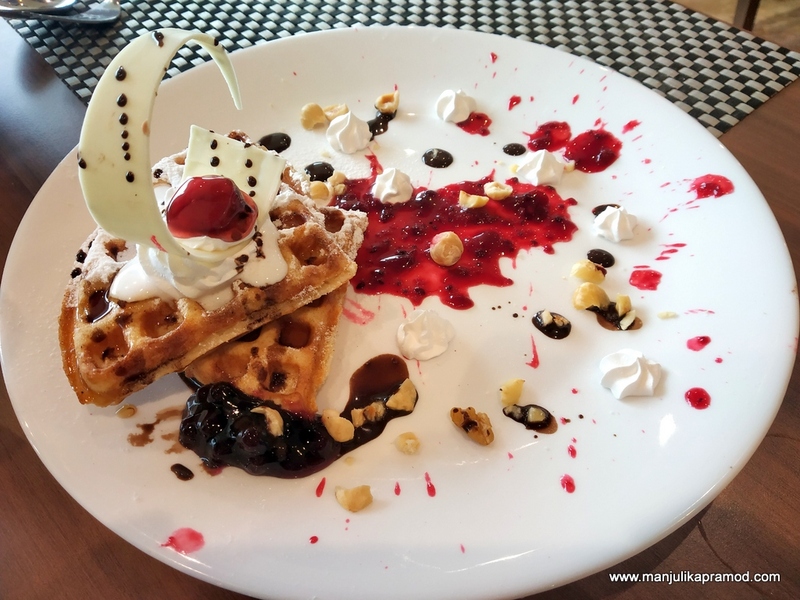 The restaurant offers a buffet breakfast, prix fixe fine dining and a casual ala carte street inspired fare throughout the day. I must confess I did not get the time to use the pool. Everyday, there was a chill in the weather and other things kept me busy. The swimming pool also has a very strategic location. It is not somewhere in the middle of the hotel but on one side which also offers a stunning view of the white city. The spa, gym and children’s room is still under construction. But they have an idea of putting all the three under one roof so that when the parents go for their pampering things, their kids are busy playing. 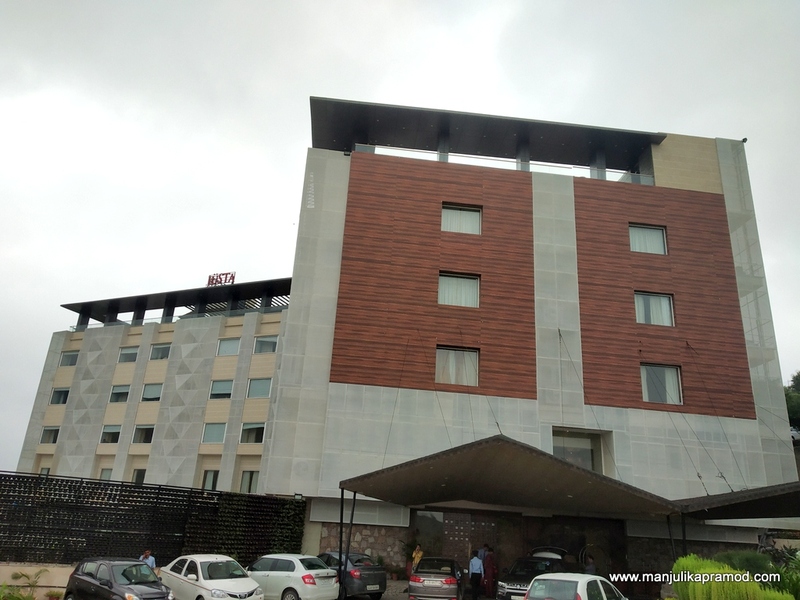 They have a terraced lawn as well as a banquet hall too, making it a fit for destination weddings and other family functions. The premier and executive rooms also have beautiful decors and thus you will be not be disappointed with any choice. They are almost ready with a beautiful terrace on the highest floor which will be used for parties, functions and small gatherings. Come winters and this place will be rocking with action. Some beautiful scrap art and graffiti has already taken over the place and made it ‘party-ready.’ I would love to go back here to chill in the winters. The location is just superb. If you are driving to Udaipur, they have a parking space too. Everyone was extremely helpful and went out of their way to make our stay comfortable. My stay was part of invitation but my experience as authentic as it can be. 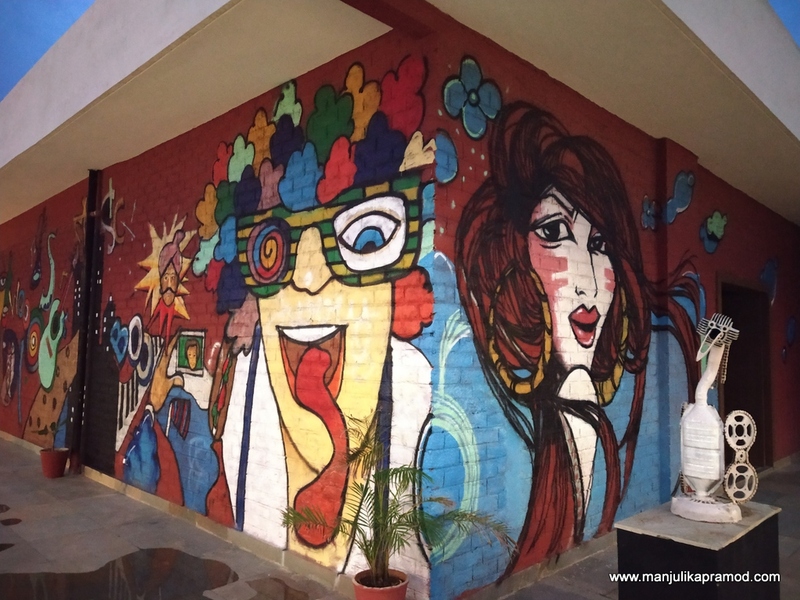 In my next post, I will show you around Udaipur, from must visit attractions to wall art. Keep following. Lovely! Udaipur is one of my favorite cities in India. Your experience at this resort seems to be exceptionally good. The views from the balcony are amazing! Looks really great. I heard the food is exceptional at Justa properties. Looking forward to my stay there this week. 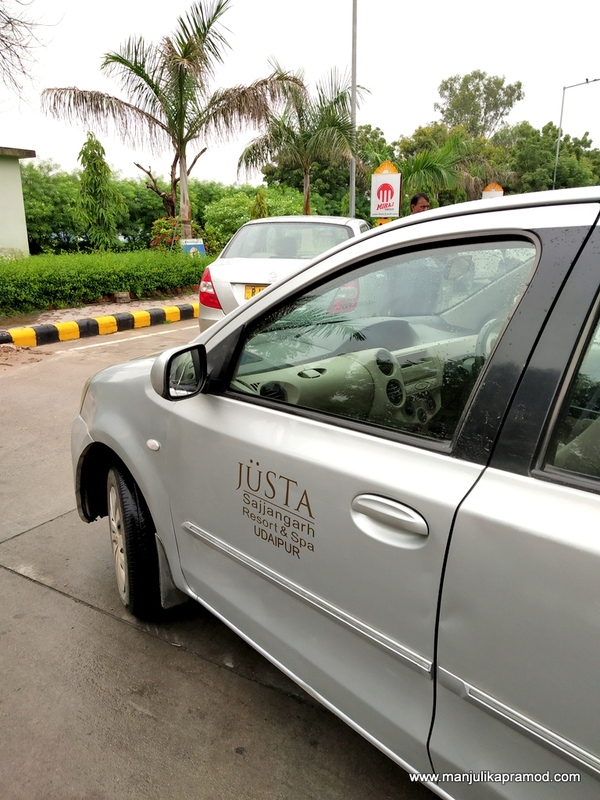 Excited to discover what all the buzz around Justa is about. The room looks really big. 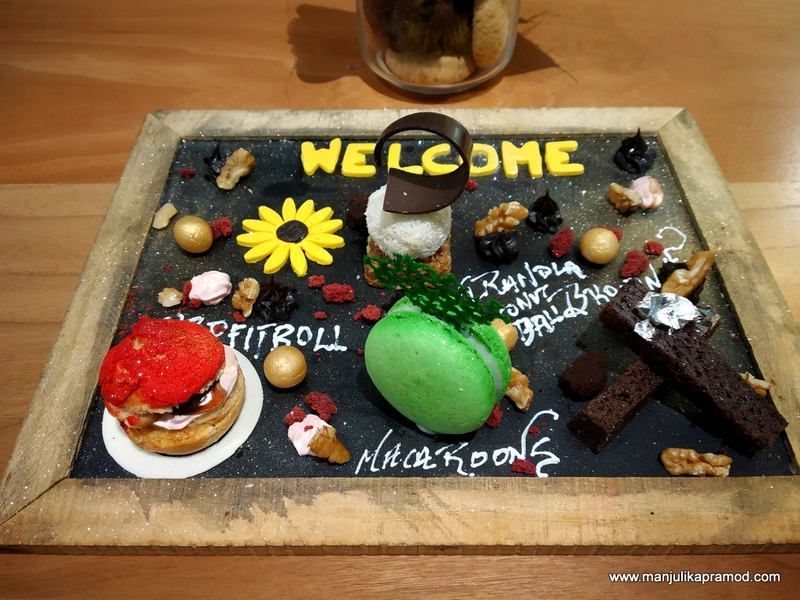 This resort has everything I’m looking for, and that dessert looks so good! I love the views from your room too, and given I’m a pool girl, this really is my kind of place. Will remember this resort if I ever visit India. I am truly impressed by all these beautiful colors. 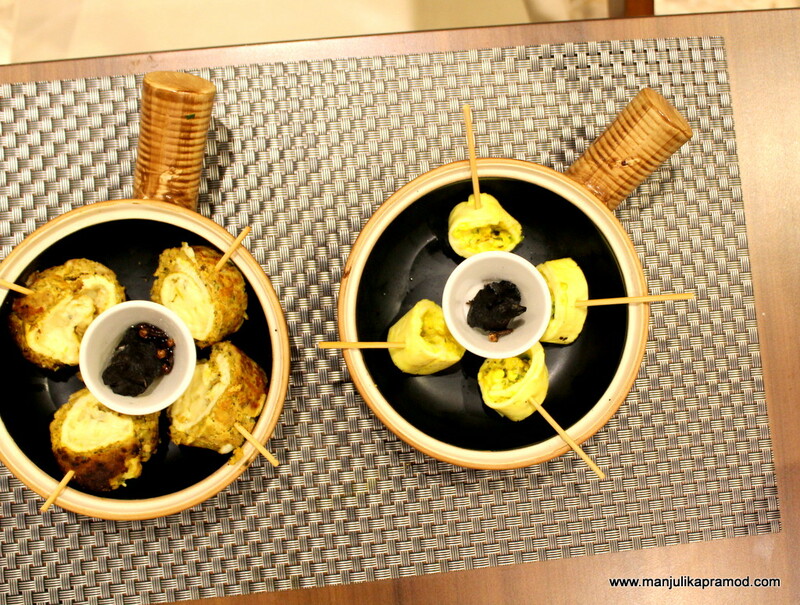 Not only on the decoration of the rooms but also the food itself. Everything looks so bright and inviting. I am sure even a cloudy day becomes bright with such a surrounding. 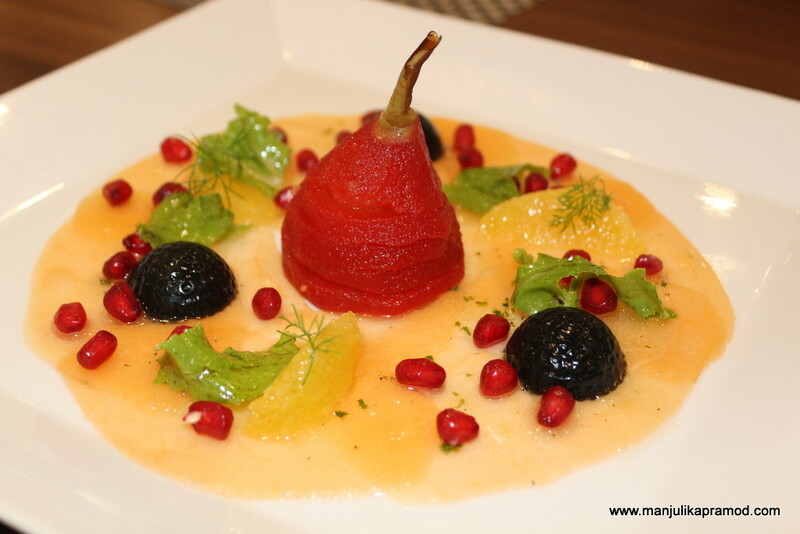 The Sabor restaurant would be definitely my place to stay – such fantastic food creations! Very nice recommendation. Udaipur is one of my favorite cities in India but I never knew about this place. I will definitely consider it for my next visit. Seems like you had a great time here. Well you definitely had a great welcome by the monsoon king! Feels so nice to be in Rajasthan when its all cool. And that resort is simply WOW! What amazing food. Would love to be here in Udaipur. 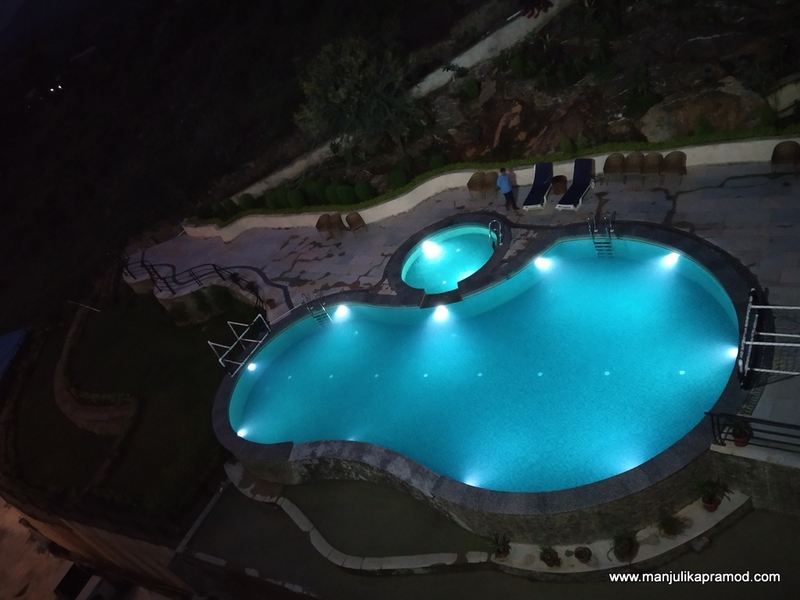 JuSTa Sajjangarh resort looks like the perfect place to stay in and explore the beauty of Udaipur. The decor of the place looks so visually pleasing. I like the way the corridors have been done up which gives an inkling of what lies inside the rooms. 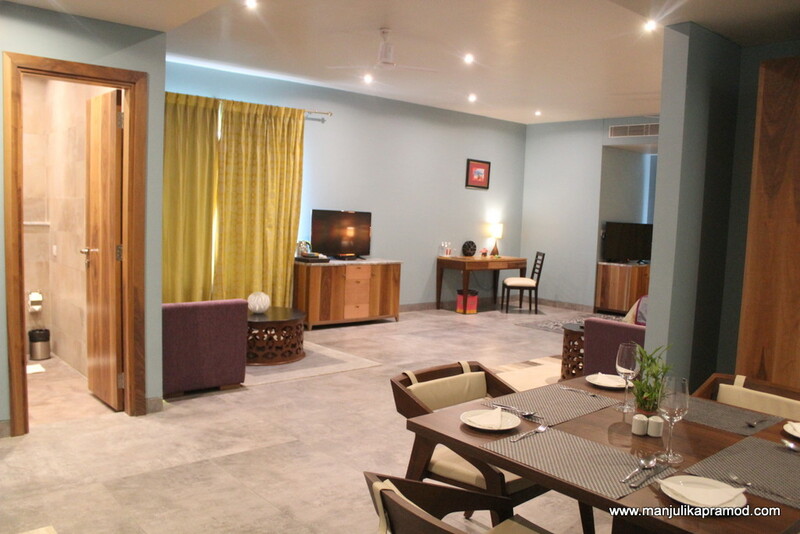 The suite looks massively spacious and the look of the swimming pool too is inviting. The best part of course is waking up to views of the fort.